A mediterranean four-acre hillside garden overlooking the sea and St. Antony’s Head. 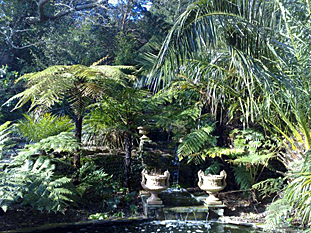 The water gardens are a particular feature while palms and other sub-tropical plants abound. 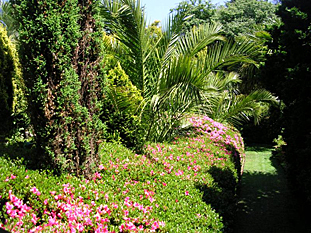 The gardens at Lamorran House, as now laid out, were started when Mr and Mrs Dudley-Cooke acquired the property in 1982. A large collection of Rhododendrons and evergreen azaleas were brought from their former garden and formed the basis for the early plantings. Situated on the Roseland Peninsula with extensive views of St.Anthony’s Head and lighthouse, the garden enjoys a favoured microclimate in an already favoured area, and frosts are very rare and not of any severity except in a very exceptional year. During the last 15 years, frost has only been recorded in the exceptionally cold January 0f 1987, (lasting for four consecutive nights the lowest temperature being -8c) and again in 1997 a moderate frost of -3c was recorded on one night only. More damaging to the large range of sub-tropical plants is the winter damp and, of course, because of the very close proximity of the sea (the garden is virtually bordered on three sides by the sea) the wind. The garden faces due south on a sloping hillside and the use of extensive shelter belts of trees has greatly moderated the influence of the wind, although careful choice of planting sites has to be made. 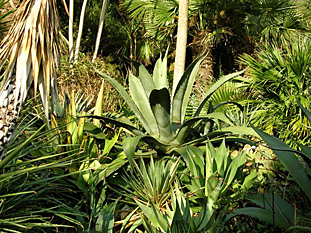 Growth in the garden is virtually twelve months of the year and advantage has been taken of the benign climate to plant a very diverse range of plants from all over the world with considerable emphasis on Southern Hemisphere plants and sub-tropical vegetation. The garden was conceived and designed as a whole albeit that the garden was constructed in three separate stages. The intention was to create an intimate garden very much in the mould of mediterranean gardens but with water ever-present both as a backdrop to the garden and with running water featured in the many pools and streams. Many features are included to divide the garden into intimate compartments – i gardini secreti – which the visitor can find and explore. Hence there are areas of woodland, a water garden in Japanese style as well as temples and archways in the steeper parts of the garden and a small bridge on which to lean to look out over the bay exhibiting a distinctively Venetian influence. Inspiration has been drawn by Robert Dudley-Cooke, for the design of the garden from many quarters. Initially influenced by the Japanese style of gardening, the design for the garden has intended Japanese with and incorporated many features or ideas from the Mediterranean gardens, particularly those laid out and planted by the English around the turn of the century.